Place all ingredients in a food processor and process until combined thoroughly. The mixture will look crumbly, but squeeze it in your fist to see if it adheres. If needed add a little more coconut oil or maple syrup. 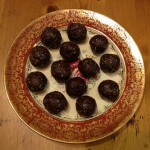 Form into balls and refrigerate before serving.